USAC issued Wave 19 for FY 2018 on Friday, August 17th for $36.8 million. Cumulative funding as of Wave 19 is $1.61 billion. USAC’s Schools and Libraries News Brief of August 17, 2018, discusses two funding process topics, both partially related to the change made earlier this year to process E-rate payments through the U.S. Treasury rather than through commercial banks. Both situations addressed in the News Brief are fortunately not common but are important to understand if they do occur. Generally, if an applicant or service provider is delinquent on an E-rate debt, perhaps as a result of a Recovery of Improperly Disbursed Funds (“RIDF”), or is in Red Light status, USAC will simply withhold any disbursements until the debt is settled. In the special case of E-rate service providers who are also USF contributors, but are delinquent on those USF payments, USAC will net out any delinquent payments against pending invoices. Invoices approved by USAC are paid by the U.S. Treasury. If any outstanding debt is owed to other federal governmental agencies, however, the U.S. Treasury will withhold such debt from the payment. Should this occur, E-rate applicants may get conflicting signals — notices of successful payments from USAC, followed by notices of offsetting debt payments from the U.S. Treasury. 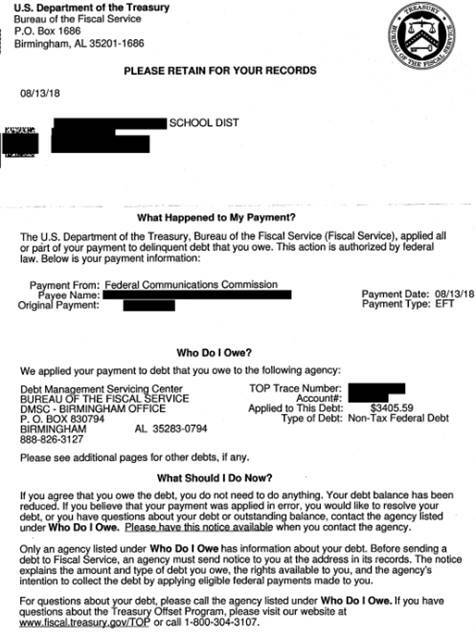 Most E-rate applicants are familiar with USAC payment letters, but few — fortunately — have seen the “What Happened to My Payment?” letters from the U.S. Treasury. If only for curiosity sake, a redacted example of such a letter follows this article. If funds need to be returned to USAC, payments must be made electronically to the U.S. Treasury. 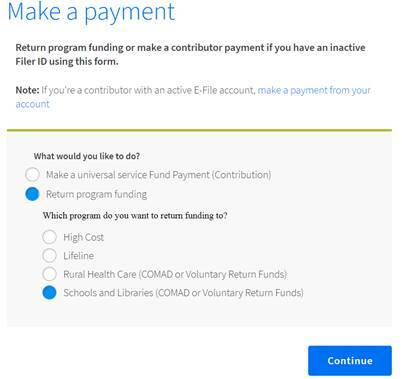 As examples of common situations in which a return of funds are required, the News Brief cites funds received in error or — in somewhat unfamiliar language — “a discrepancy between your projected support amount and the actual support disbursed.” As best we can determine, this language comes from the return of funds instructions for other Universal Service Fund (“USF”) programs. For E-rate purposes, better examples are contained in the Returning Funds to USAC section of USAC’s Schools & Libraries website. To actually make a return of funds payment, go to the Payments section, choose the right USF program (see below), and follow the instructions.